Fayette Home Care and Hospice, part of UPMC Home Healthcare, provides a wide range of home health care services for patients of all ages. Our home health experts treat every patient with the compassion, quality and dedication for which UPMC is known. Fayette Home Care and Hospice is part of your community. Our nurses and therapists live and work in their home communities, providing individualized, timely care to patients and their families — in their homes — while they recover from injury, illness, or surgery. 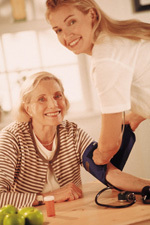 Fayette Home Care and Hospice employs home health experts that live and work in their local community. Our care team includes specialized nurses, highly skilled rehabilitation therapists (physical, occupational and speech), social workers, dietitians, home health aides, and trained administrative staff. Our goal is to provide each patient with personalized care in their home while ensuring the best possible experience. If you need rehabilitation after an illness, injury or accident, our physical, occupational and speech therapists are highly trained and will work with you to help you on the road to recovery. To heal wounds as quickly and painlessly as possible, our specialty-trained nurses work with the most current techniques and wound care products available. They will teach you how to comfortably follow a self-care plan to hasten your healing. Our unique nutrition service lets you consult a nutrition specialist at your home or on the phone. Registered dieticians can assess and advise you about specific needs related to your health condition, such as diabetes, heart disease or obesity. Our medical social workers know how to connect you and your family to the right services and resources in the community, whether you need a support group, an assisted living facility or financial aid. During recovery, it may be difficult or impossible to perform daily personal care. Our home health aides can help you with dressing, bathing, and other tasks. All have successfully completed a certified nursing assistant program. In addition to UPMC Home Health's standard services, Fayette Home Care and Hospice also provides the following services. Private duty services are available to patients and their families for a variety of needs including companionship and supervision, assistance with daily activities, housecleaning and more. Patients can ask for a consultation to assist in identifying their needs. As circumstances change, our services can adapt to meet your needs. Fayette Home Care and Hospice strives to help patients live peacefully and comfortably at the end of life by providing hospice care to patients in their home. Hospice care helps terminally ill patients live out their final days with dignity, comfort and the best possible quality of life. Palliative Care is a comprehensive, patient and family centered approach to improving the quality of life for people who are living with a serious or potentially life-limiting illness. Palliative care can be, and oftentimes is, given in conjunction with treatments designed to cure a patients underlying illness. The advanced care team works to create a treatment plan taking into account the individual patient’s goals and wishes for care.